Being a tall girl who has a not-so-secret love affair with the colour pink, I've always had a soft spot for flamingoes. They're tall too - and gangly, have long legs, and are my favourite colour! I also saw a great meme online recently that contained some sage wisdom associated with this magnificent creature. 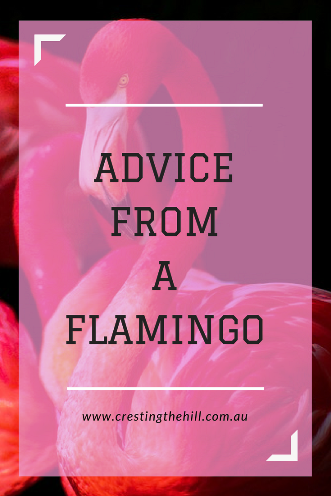 Today I thought I'd elaborate on that advice which comes straight from the flamingo to you - it also reflects some of the lessons I'm learning in Midlife. I've been guilty of sitting back and waiting for life to happen to me. It's so easy to be complacent and think that you're doing okay and don't need to make any forward progress. I've noticed that things in my life have been a bit "same old, same old" lately and I'm planning on changing that - starting this month. There are a couple of things that I want to make a start on - one is taking up Tai Chi again, and the other is to start an online study course of some description. One is for the body, the other is for the mind - time to shake things up a little and get moving again. There's a lot of emphasis placed on physical beauty and looking amazing for our age these days - that's supposed to be the way we prevent becoming invisible in Midlife, but I'd like to suggest a different way to stand out from the crowd. How about being the person who has the brightest smile, the person who always has a compliment to offer, the person who has a kind word, or who lends a hand where needed? Wouldn't it be nice to be remembered for how lovely our nature is and how generous our attitude towards others is? Who wants to be a glamazon when you could instead choose to be wise and warm, caring and compassionate? Let's stand out for the right reasons now we're in Midlife. One of the biggest benefits of blogging has been discovering my tribe - or my "flock". Meeting so many wonderful Midlife women (and a few blokes) who are happy to be 50+ and who share their enthusiasm and positivity has been an absolute blessing. They share tips and encouragement to keep going with my writing, they are generous and they are warm and witty - what's not to like? I also have a handful of friends IRL who are my flock too - I think in Midlife your flock thins out a little and you find yourself focusing on the people who really want to be part of your life. When you find these people, take the time to meet up, to chat, to share stories, to invest in each other's lives. Nobody wants to die old and alone, we all need those friends who will be keeping us company in the old folks home! I think "balance" is one of the most important words in my life dictionary these days - along with "authenticity" and "boundaries". If we don't have balance in our lives then we end up putting too much emphasis on one area and burning ourselves out. It's all well and good to be passionate about something but if you lose sight of the other areas of your life then you lose yourself along the way. Keeping fit is important - but not at the expense of having no time to sit and have a cuppa with a friend. Enjoying your career is great - but not if it means neglecting your family. Blogging can be wonderful - but not if it means you are online 24/7! We need to remind ourselves of the importance of each aspect of our life and keep them in balance. This works on two levels - firstly in our physical selves. I know my physical flexiblility is less than it was when I was younger. I discovered that in a painful way when I attempted a cartwheel in my 40's. Good grief - I never knew how many joints in my body could weep at the same time! I've also noticed it when I've been sitting at a keyboard all day at work or on the blog - my shoulder blades are quietly screaming for a break and some stretching. Flexibility also comes into play in how we live our lives. It's easy to get so caught up in your normal routine that you forget to allow some time for spontaneity. If someone says "let's go somewhere and do something" this weekend - seize the moment and go! Don't let the boring routine of life stop you being flexible enough to try something new when it's offered. We all need this little piece of advice - don't stick your beak in where it's not wanted - this applies to giving unasked for advice to your adult children, it also applies to situations at work or with friends where you don't need to by nosy - you don't need to be in on every little saga that raises its head in the office or in your casual relationships. Also try not to lie - it's much easier to keep your story straight if you're not embroidering the details, don't get caught up in the schemes of others, stay true to your values - honesty and authenticity help you sleep well at night. Try new things - don't be stuck in the mud of never stepping out of your comfort zone. Take that course, try that new activity, go somewhere new, eat at a new cafe, visit a different holiday destination. Sometimes those unexpected adventures lead to new destinations and grow us much more than we expect them to. Do any of these pieces of advice resonate with you? 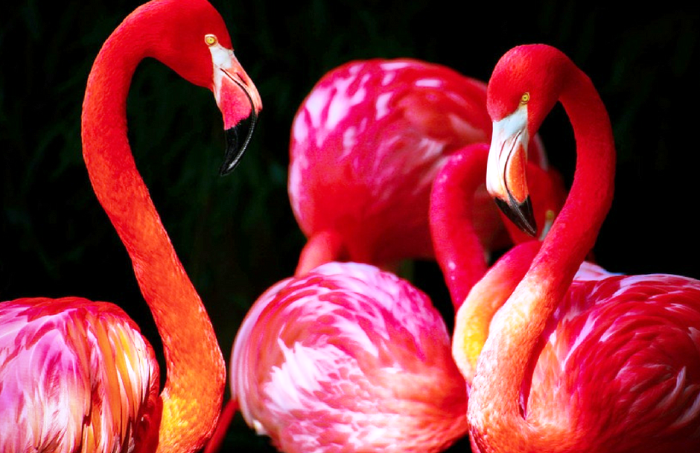 Are you a flamingo standing tall and stepping out in confidence? Or are you standing on the shore, not wanting to get your feet wet? I feel a bit the same way Yam - I get out of bed in the morning and feel all the little creaks and stiffness in my joints. Went for a ride on the back of my husband's motorbike yesterday and felt it afterwards too! Wisdom, Fun, Balance and Pink...What's not to love? From one tall girl to another! My doctor once described me as "long and lean" Donna - now I just have to work a bit harder on the "lean" part of the description! Love this! There's an ad on the back of a bus for one of the retirement homes up here that says "I'm more flamingo than bingo"...I love that too. Have a great week. I try to keep balance by tracking the important activities. Especially now that we've moved and I'm essentially jobless, I have to work to create that routine of touching all corners of my life. I like your take on standing out - choose how you want to stand out. What do I want to be known for, in the end? Food for thought. I think way too much emphasis is placed on physical appearance these days Red - trying to be gorgeous on the outside and maybe if we put as much effort into being gorgeous on the inside then the world would be a nicer place. Hi Leanne! Firstly, I love flamingoes they are so bright and colourful and I love everything you have written. I especially like the part about keeping your beak clean - I wish some people I know would take that advice. Good for you in trying some new things for the body and the mind. Do you know what course you will take? I also agree that we don't have to be 'models' to stand out. A woman with a smile and self-confidence wins out all the time in my book. I'm a big fan of clean beaks these days Sue - if someone wants to get down and dirty that's their business, but I don't want to be a part of it. I'm a big fan of peace and quiet and staying out of things. And yes, give me a smile and and some warmth any day - 100% preferable to a cool, self-absorbed person! So I'm not tall (5'1") and pink is my least favourite colour (sorry, Leanne), but everything else fits like a glove! I especially like the idea of standing out in a crowd through ways others than physical glamour. For me, I would like it to be for my smile and strong sense of vitality - the last, something I've been working to recover ever since the burnout and I think it's finally, finally coming back. I'm in the process of extricating myself from some extended family nonsense that will help me to keep my beak clean going forward - can't wait! Then I'll be able to return to the new experiences you talked about, including the dozen courses I've got in my Udemy account and the handful of ones I'm signed up for in Coursera. Enjoy your changes this month, Leanne. Looking forward to hearing what you end up doing. Wow! You have a dozen courses in the pipeline! I finally found one to get started with and that is about all I can handle atm. I'm so glad you're finding your mojo again and extricating yourself from the messy family stuff at the same time. I thought you were pretty fabulous already - I am going to be completely bedazzled when you get all your vim and vitality back! I do enjoy looking at real flamingos , I even like the plastic ones people put in their yards. This is a great post Leanne. Who knew Flamingos could offer so much wisdom, I am glad you culled and shared! I never can stand tall being a short woman but I always try to stand with confidence and try new things.Being this age and not competitive, I don't care about my success on new things, just the trying is the fun and the goal! I'm glad you're a fellow flamingo lover Haralee - and yes, this is an age where you can have a go at something and realize it's not life or death if it isn't perfect or if you didn't nail it - such a nice time of life isn't it? I love your whole attitude towards mid-life, Leanne. It's not about looking fabulous, it's about being fabulous. Laurel you summed it up beautifully - in fact I might quote you in a future blog post with that last sentence! Thanks Candi - I just thought they were all fun but also had a ring of truth to them - maybe because they're areas I've been working on in my own life over the last few years. I'm one of those people who has pink flamingo's in their yard. In Feng Shui, they can substitute for a phoenix... I read it somewhere. While I don't relate to them personally (I'm not tall, not a huge fan of pink, and Blue Heron's are actually my favorite bird) ... I do love how you've turned them into some sage advice. Wade in, get your feet wet, spend time with your flock. Wonderful! I think it's amazing that you have flamingoes and that they can be equated to phoenixes - it makes me smile to think of a flamingo trying to rise from the ashes! I don't even know where to start, I love this so much! The flamingo might have to be my new mascot! Several of these items are things I am already working on--and the others are things I am now motivated to try more of. Thank you Leanne and have a beautiful day! Keep your beak clean! I love that bit of advice. It's a shame more people don't remember to put it into practice isn't it Jennifer? Yes! Especially those that are considered leaders! Yep! Balance is a big one for me too - it's so easy to get carried away in one area and neglect the rest of your priorities - but it usually takes a wake up call before we notice we're sliding out of whack. This is a wonderful post! What great advice. I like the one about standing out in a crowd. A smile makes you radiate with sunshine and people can see it. A smile is the Midlife woman's secret weapon isn't it Rebecca? Nobody is invisible if they are radiating sunshine. Thank you, Leanne, for your great list of advice. All your points resonate with me. I like flamingos, too. I had so much fun writing this post Natalie because they were all points I can take home and work on. Thanks for another great Link Up, Leanne. I've shared this on my Social Media. Much appreciated Donna - and I hope to see more posts from you once you finish lazing around with your granddog over Summer! Love the analogy, Leanne! I thoroughly enjoyed your thought provoking post, and thank you again for being so supportive and having me join in on this linking party. Hi Lori - it's been a pleasure meeting you - and seeing how far you've come with your blog in such a short time. You certainly proved that with the right mindset you can achieve amazing results. Loved this - keep your beak clean! Hi Erith - it's certainly one of the most important on the list for staying away from toxic people and situations! Maybe you're a Munchkin flamingo Min (like those cute cats that have short legs?) I have been thinking about Pilates and yoga, but the classes are soooo expensive! I've just started Tai Chi so I'm going to see how that goes for my flexibility and it took me out of my comfort zone going to a class by myself and trying something new. I've read a lot of these over the years and never fail to enjoy them. Loved your take on the tips! I have too Donna - but this one really resonated with me - probably because flamingos always make me smile and the tips were all quite useful! What wittily written sage advice. I had no idea flamingos could serve as such role models. Would love to have you join us for the Stepping Outside Your Comfort Zone as you experience new activities while wading into life. You could inspire others to try Tai Chi or an online course. We post the last day of each month. Please let me know if you would like to be added to our email group for reminders!! My email is mommyhon333@hotmail.com. Hi Lesley I'll definitely look at linking up with you if I manage to get my head around Tai Chi and also the online course I've started. So many things still to learn and so little time to fit them all in! Hi Patrick - thanks so much for visiting again and for joining us at #MLSTL - it's always great to have a bloke onboard. Balance was a big one for me too Jennifer - and how to get the amount of time right that I invest into different areas of life. It's so easy to get consumed by one particular interest and to neglect things that are less engaging, but just as important. I loved this. Flamingos are great! Hi Deb - they were such good points for me and I thought others might enjoy them too - it's easy to look at something and not really take it to another level - once I started drilling down on the points they became even more relevant. 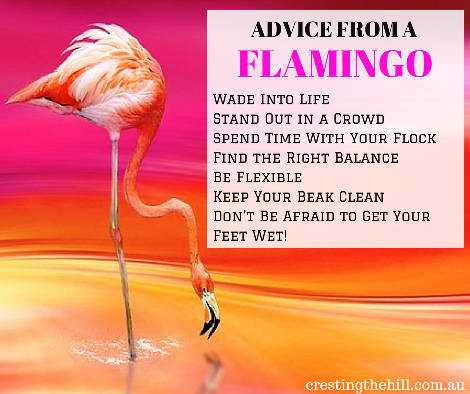 Thanks Jan - I have a bit of a soft spot for flamingos and these little advice snippets meshed really well with my world view. I absolutely LOVE this post! Whimsical - fun - creative - and so thought provoking! Leanne I love this post. If I can just follow a couple of these ideas I will be happy. I'm glad you liked it Victoria - I'm working on all the areas of flamingo recommendations - some I'm doing better at than others! I love the analogy of life being like a flamingo- it is perfect! I know! I loved it too Michele - it's my favourite bird from now on! Among all the suggestions from the flamingo, what I can relate with most, and what I try my best to follow, is "Find the Right Balance". I would like to get my feet wet, but before that I would like to know how deep is the water! CAN CANCER HAVE A SILVER LINING? WRITING MY FIRST ESSAY IN FORTY YEARS! WHY START A BLOG WHEN YOU'RE OVER 50? HAVE YOU HEARD OF TOFI?